Today's edition of the International New York Times features an editorial cartoon by Patrick Chappatte, commenting on the recent attack on the Muhammad Art Exhibit in Florida. The cartoon depicts sketches of Mohammed being judged by Pamela Geller and other members of the American Freedom Defense Initiative. One of the sketches shows Mohammed as a stick figure, as in a 2010 episode of South Park. 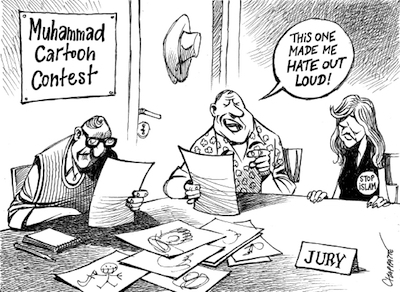 This is Chappatte's third Mohammed cartoon. He previously drew Mohammed in a 2006 cartoon, after the Jyllands-Posten controversy; and in a 2012 cartoon, he drew a miniature reproduction of Charlie Hebdo's Mohammed caricatures.